Following the culture and forests of the last few days yesterday we decided to do a nice steady lakeside walk. We decided to go to Wast Water which is much less touristic than other lakes with no villages, paddle-steamers or through roads to distract us. I have been carrying an injury the last few weeks and I decided if we wanted to go off the beaten track that it should be nice and level and the only place level around here is the shoreline of the lakes. 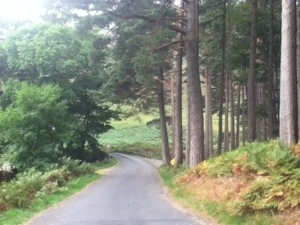 The drive was a pleasure with no other cars for the last 8 or 9 miles which is paradise for me. Of course you do get these moments at home with no moving cars but traffic jams aren’t the same. I always like going in roads that simply end and seeing how the nearer the end you get, the quieter and wilder things get. Much of rural England is criss-crossed with dry stone walls which have no cement but are put up so skilfully they last for centuries in places where hedgerows wouldn’t really grow and they also give the sheep places to hide from the weather. There are no longer any wild wolves or bears in GB they were hunted to extinction centuries ago. They do have some large reservations of them though and campaigns go on both sides of the debate whether they should be let loose. Currently they are reintroducing none hazardous large mammals to test the water so to speak. So as long as you aren’t so small to get attacked by eagles, foxes trampled by cows or do stupid things with snakes the only worries here are the terrain and weather. Due to the severe weather and terrain here there is a breed of super sheep that is to be seen everywhere here called ‘Herdwicks’ and they live wherever there is grass to eat. Sometime one catches your eye a thousand feet up and you wonder how on earth he got up there. 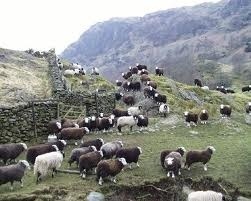 Herdwick Sheep – what are Ewe doing? On the mountain tops and moors there are no walls so the sheep are colour coded with spray paint so each farmer can find their own sheep after the winter snows . 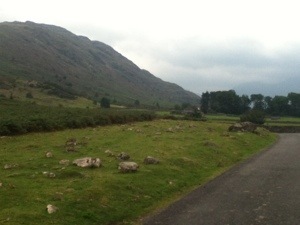 We had to stop the car twice due to sheep on the road. 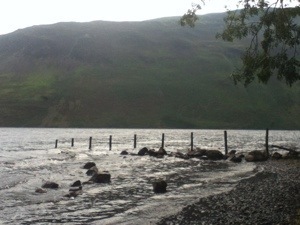 We reached the lakeside at 11am, we were in a race against time as heavy rain was forecast from about 11am. We have done well so far with only warm and fine weather for 5 days. 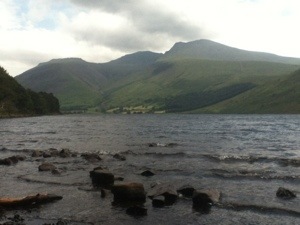 A great viewpoint to prepare for a long walk and share a drink. 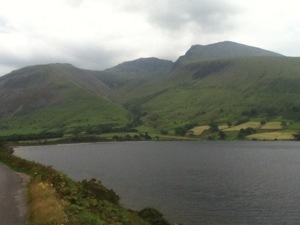 Wast water is just 3 miles long and half a mile wide but it is the deepest lake in England. You can see the extremely steep mountain opposite and apparently that slope keeps the same angle for another 250 feet under water. 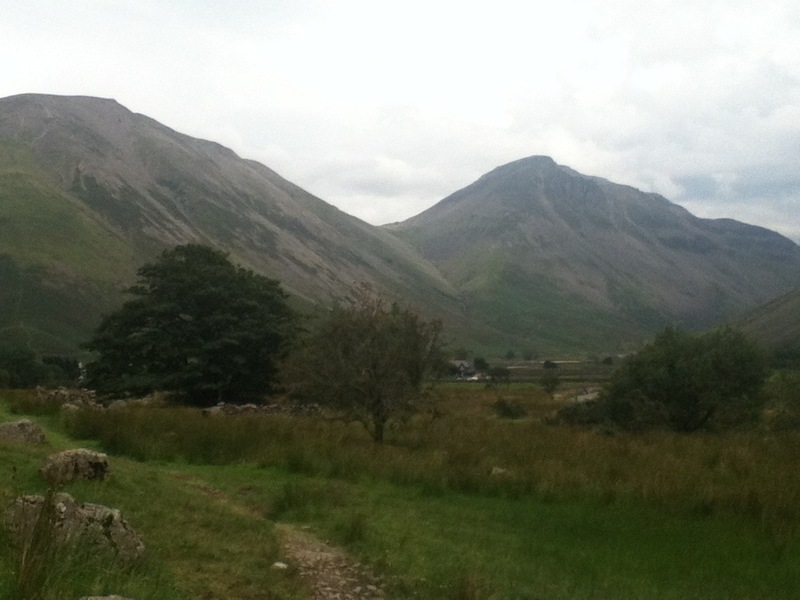 The mountain slope has lots of post glacial loose rock called Skree which is very dangerous and can avalanche like snow. This is on many local mountains but there is so much here the mountain is called The Skrees. 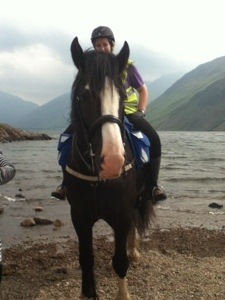 Following a cup of tea and a biscuit we set off to the Lake on foot where there were some horses. A rider on a Shire horse. They all wanted their photos taken! 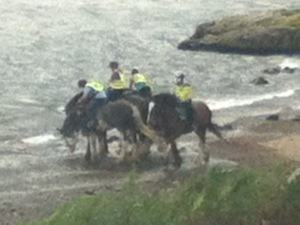 They had ridden 12 miles with tourists from England, Germany and Canada on them. Sometimes these horses are ex-police horses come here to retire from city life… What a nice idea! 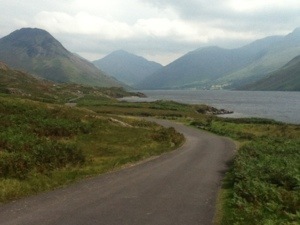 We set off down the lane to Wasdale Head at the far end of the lake. When we last did a similar walk 2 years ago we picked a much bigger lake and got diverted into climbing a mountain and ended up doing 24 miles which pretty much was the end of us walking that week! All if this land belongs to The National Trust which preserves landscapes and old buildings for future generations and encourages farms to operate using traditional skills and materials. After a mile or two we realised that there wasn’t any fishing or much animal life here and when I got back to the Internet I found that this lake has no oxygen of living organisms in it. 20 odd years ago a missing woman was found in the lake. She had been killed and hidden deep in the waters but due to the waters the police were easily able to identify her after 8 years. 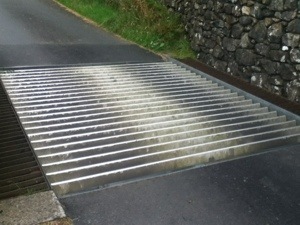 The photo above is of a sheep grids and they are on many roads around here. The sheep are unable to walk on the metal rollers though I heard in Australia one sheep rolled his body of one and within days he had taught the whole flock to do the same. It is best to drive slowly over these grids as they shake and judder the car and make a noise like you gave just tried to walk through a futuristic force-field. 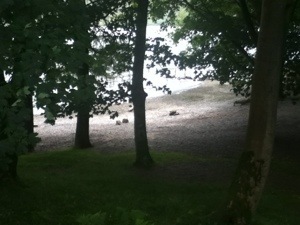 The Lakes are one of the last strongholds of Red Squirrels but sadly we didn’t see any. Every now and then we came across secluded bays like this one. In the distance we could see the end of the lake and a remote farm. 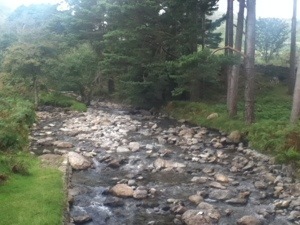 We marvelled at the mountains with streams running into the road every 20 feet. 4,000 miles from Egypt lies Pyramid Mountain or at least that is what we called it. Due to the shape of the valley a strong wind would rush down over the lake lifting up waves and spray into twirling mists that were like a refreshing shower in the warm weather. 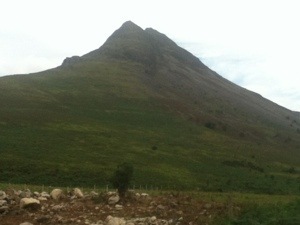 Englands tallest mountain and continual cloud generating machine. 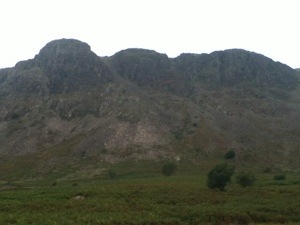 The mountain above is the whole reason there is a road here, well that and the pub at its base for the climbers. 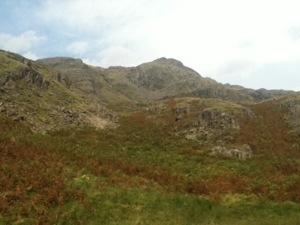 That is the Scafell Pike part of the tallest mountain in England. 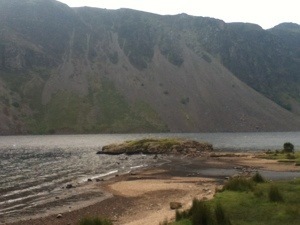 A few miles on the other side is where rock climbing was ‘invented’ and also where we went camping 2 years ago. That farm gets 140 inches of rain a year and recently got almost 13 inches in 24 hours making it the wettest place too. Of course it rained on us every day for 5 days so we came gone early. It is amazing what a few miles does to the weather. The iPod camera is just not good enough to show the awful drops near the summit that become impossible to see in anything but perfect weather and despite the fog or cloud up there, that is as close to perfect weather as you can get. 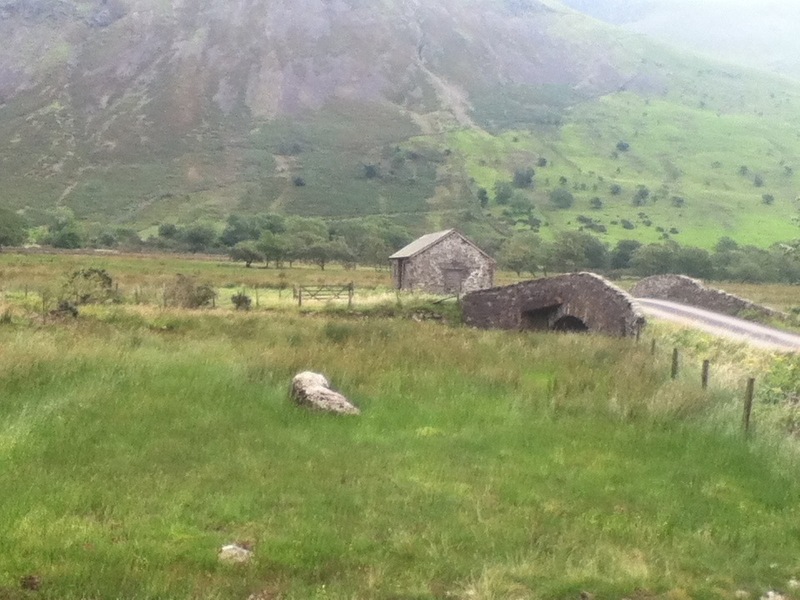 After 2 hours or so of walking, taking photos, gawping at the scenery and yes talking to sheep we reached the end of the lake and the end of the road. Not wanting to do any climbing we went along a path to Wasdale Head at the end of the valley and sat on the grass to have a quick bite to eat and enjoy the surroundings. A nice spot for a rest and a chill, looking at the clouds and the mountains and hearing… nothing but the wind in the grass. This place seemed a million miles and centuries different even from our holiday town let alone our home. Hard to believe it is the same small country. If you’re thinking that I had a few moments wondering if I was dreading going back home and to work next week during my day dreaming then you’d be so right but who could blame me. With our chocolate bars eaten and drinks in the car we decided to head back. 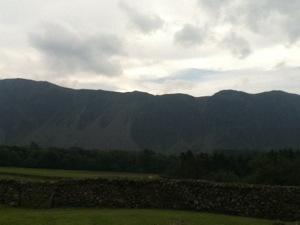 The weather was turning and already the mountains were becoming shrouded in mist. We knew what was coming. While it is true that outward journeys often seem longer than return trips as you don’t know where you are going, our 2.5 hour walk out here took just half that time going back. That’s what an imminent down pour dies to you. The rain did start lightly 15 mins before we reached the car but exactly to the second when we opened the doors all hell broke loose. We had sandwiches inside as the car shook in the wind the rain made looking out of the windows impossible, we couldn’t even see the lake 20 seconds walk away. Hence the lack of photos. In centuries past these dark mountains with these storms were thought to be evil and devilish places, we just sat in awe munching our sandwiches listening to music and thought to ourselves what a fantastic day we had had, again. 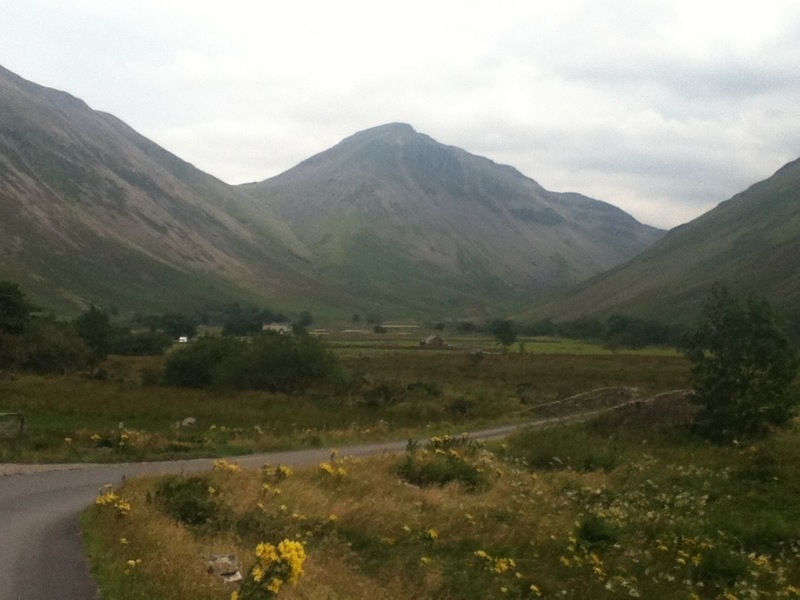 This entry was posted in Cumbria & The Lake District, Life, Travel and tagged Cumbria, holidays, national trust, outdoors, Summer, Travel, walks. Bookmark the permalink.